As a little boy, Sam Staziak was taken in by a police officer named Harrigan (Grove) after his own father freaked out because they both have the scanner bloodline. Little Sam grew up to be a cop like his adoptive father, and now, as an adult (Quinn), he looks to follow in his father’s footsteps on the L.A.P.D. But an evil, unhinged brain surgeon (aren’t they all?) named Karl Glock (Lynch) is using unsuspecting normal citizens and using them for his sick, twisted experiments. He makes them believe all cops are supernatural, grotesque monsters, so when they see them, they snap and start killing them. Now trying to figure out and combat an amorphous, confusing threat before more boys in blue get killed, Staziak must tap into his scanner abilities which have caused him nothing but pain in the process. 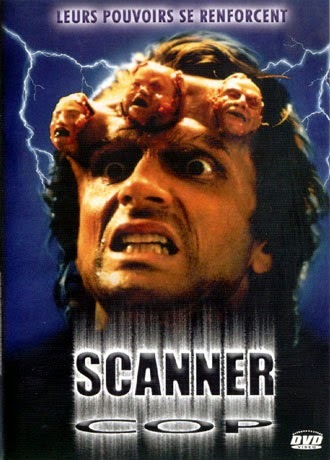 But too much scanning can lead to insanity and sensory overload. Dr. Joan Alden (Fluegel) is helping, but truly only Sam can come to terms with who he is and stop Glock in the process. Will he do it before it’s too late for the L.A.P.D. - and himself? Find out today! Much like we said in our Scanner Cop II (1995) review, not being sci-fi fans, we weren’t going in expecting much. But there is more to Scanner Cop than you might think, and there are plenty of interesting ideas at work here that raise the level of enjoyment considerably. You can tell the writers actually thought about the plot a lot, which goes a long way and is much appreciated. The intelligence and serious, downbeat tone would surely do Cronenberg proud. 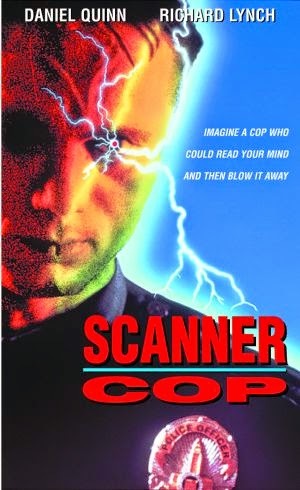 Just the idea of a “scanner cop” is rife with possibilities, and the movie, thankfully, capitalizes on them. We couldn’t help but wonder why movies about other scanner professions never materialized: “scanner firefighter”, “scanner teacher”, “scanner professional boogieboarder” - the options are endless. After a long career as a writer and producer, this was director David’s directorial debut. He’d worked with fellow Canadian Jeff Wincott a lot, as he was a writer on Mission of Justice (1992) and Martial Law II (1992), and produced Marked Man (1996). David clearly learned a lot during his time doing other roles on film sets, because it has a professional look and you’d never know it was his debut. While the humorless, somewhat bleak approach he took was a good one this time around to sell the bizarre subject matter, some levity would have helped, and as David did not return as director for part II, seemingly a little more fun was had the second time around. The cast is plentiful with B-movie stars: fan favorite Richard Lynch does his classic baddie thing, Brion James is in it for about 2 seconds, Hilary Shepard of Peacemaker (1990) fame plays Lynch’s assistant named Zena, predating Xena by a few years, Cyndi Pass of Mission of Justice is here too, and Billy “Sly” Williams plays a drug dealer named Eightball, among other names in the cast. While Richard Grove did a fine job as Harrigan, we can’t help but think Stacy Keach would have been a nice cast addition in that role. He even played a similar part in Irresistible Force (1993). But maybe that’s why he didn’t do it. 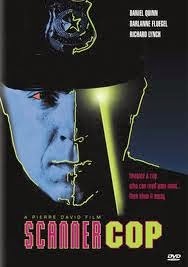 The Scanner Cop series was big on cable and in video stores at the time, and while that doesn’t seem that long ago to us, clearly it is, because in the movie characters smoke cigarettes indoors and in government buildings. Which tells us intelligent, well-thought-out sci-fi (or any types of movies for that matter) are getting farther and farther away in the past. Just compare this to the “syfy” channel’s “original movies”. The difference is crystal clear. As with its sequel, Scanner Cop is far better than you might think. Also check out write-ups from our buddies, The Video Vacuum, Film Guinea Pig, and Cool Target! Nice review. Yeah, always liked Scanner Cop 1 & 2. Good little b-movies with some clever ideas and a bit of gorey effects works. Quinn does some good work as Staziak. He's not your traditional leading man but I liked how he played the part. I love both movies. Got them in Germany only on VHS. And your idea about "Scanner Firefighter" ask The Asylum. Possibly they will do a "Scanner Mega Shark". Jack: Thanks! We agree on that. Quinn should've been of more movies of this type. Just curious, how come you guys aren't sci-fi fans? I personally love sci-fi films(especially stuff like the Cyber Tracker films). We can't get into them. Too much bad CGI and it's not real action. We're just straight up action fans like PM movies...Cyber Tracker was ok though. We definitely disagree, CGI is a plague on society along with Smoking, drugs, Ebola and ISIS. I don't think it's a "plague" at all, especially when it's done really well, and I certainly wouldn't compared to those things in the least. Can't support CGI. It puts a practical effects guy out of a job. Not necessarily, there are plenty of films that use both practical effects and CGI, so that just sounds like silly reasoning to me. Not really, most people who do practical effects usually end up working with a VFX company. I support CGI because it creates jobs and I have a tremendous amount of respect for the work they do, especially considering they have to work lots of overtime just to meet deadlines for the big blockbuster films and are grossly underpaid for what they do. We support job creation, back in the day movies looked better and people had to build and make things. All you're doing now, is pressing F1 on a keyboard. We need more real movies, less computer games. That's our position. I wouldn't compare movies to computer games, to me that's disingenuous. I also disagree that ALL movies looked better back in the day, I think some movies today look considerably better. Also it is not just "pressing F1 on a keyboard", CGI is WAY more complicated then you think. Film will always looks better than digital. CGI blood and explosions look the worst. I disagree but to each their own I guess. Interestingly enough, you may be surprised to know this, but the explosions in Michael Bay films are actually NOT done with CGI, they're done for real. Ah i see. The Rock is Michael Bay's best movie.